My refusal to turn on the air-conditioner at home means that I haven't been sleeping well in the last couple of days. As soon as the temperature warms up, I wake up. The downside is obviously not getting enough quality zzz's for me. However, the upside is that I would take advantage of the extra time on my hand with some quick and easy baking. When I looked in my fridge this morning, that green carton of buttermilk stared right back at my sleepy eyes. I was left with no choice but to make buttermilk muffins. Preheat oven to 350F. 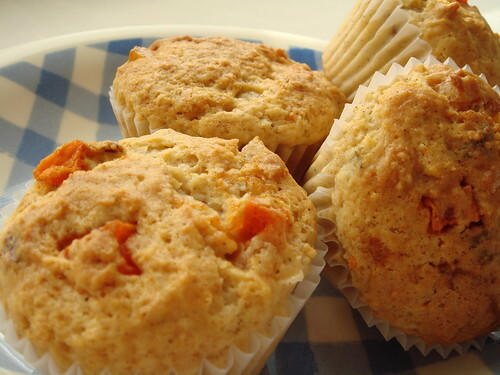 Line two dozen muffin tins with paper liner. 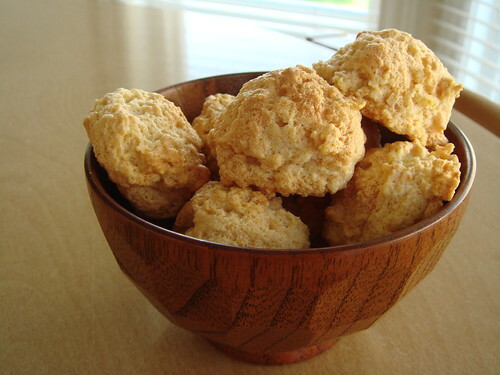 In a large mixing bowl, stir together flour, baking powder, baking soda, salt, sugar, cinnamon, and ground ginger. In a medium mixing bowl, whisk together melted butter, buttermilk, heavy cream, eggs, and egg yolk until homogenous. Pour the wet ingredients into the flour mixture and stir together with as few strokes as possible until just combined. Gently fold in nuts and fruits. Using an ice-cream scoop, divide the batter to the muffin tins. Bake for approximately 40 minutes until golden. Here's a slideshow of my stay at Ice Hotel in Sweden. I actually mean to write something about my travel but life has been busy recently. However, I really want to test out the PictoBrowser before leaving for a 2-week long gourmet expedition in Barcelona, Roses (El Bulli!!!! ), and London. I have many awesome meals in my itinerary and I plan to document my experience with lots of pictures. Hopefully, if all goes right, I'll be able to share my experience with you on a daily basis. Keep your eyes on Dessert By Candy in the next two weeks for my eating adventure in Europe! Well, in Toronto, the mucky yucky sticky weather is back with a vengence after a long cool spring. Personally, I prefer colder temperature though of course my training (namely inline skating and dragonboat) benefits much from the warm weather. That being said, there are things that I look forward to in summer, one of which is ice-cream. It's not like I don't eat ice-cream all-year-round. However, cooling off under the unrelenting sun with a cold creamy treat certainly enhances the experience that much more. Only a few weeks ago, EG and I dropped by J-Town for a midday snack. I had a craving for their green tea soft-serve ice-cream but I was disappointed to find out that apparently Bakery Nakamura only have soft-serve ice-cream available in the summer months. 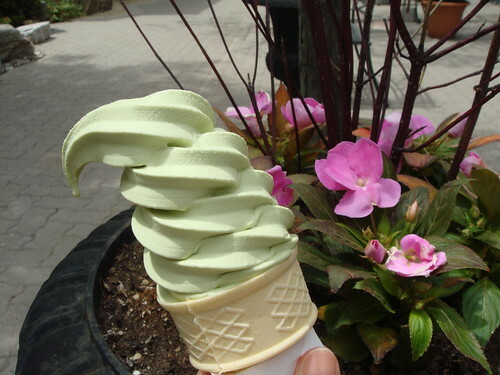 Luckily, summer has now officially arrived and I finally got my hands on one of those pale green swirl of creaminess. The taste of green tea is very subtle. In fact, I would not recommend getting the green tea vanilla two-tone swirl because the taste of vanilla would likely overwhelm the green tea flavour. As I sat on the bench with my ice-cream cone, I vividly recalled my experience with the ice-cream theme park in Namja Town a few years ago in Tokyo. I was totally mesmerized by their selection of soft-serve ice-cream with flavours such as black sesame, peach, muscat grapes, melon, and Hokkaido milk, just to name a few. Vanilla is good but I really do miss the variety sometimes. Over the last few years, I've made several attempts to go camping but none of them became reality. It's a little embarrassing to admit, but after living in Canada for close to 20 years, I had my first real camping trip last weekend at last. EG booked a campsite at Rondeau Provincial Park for a week-long inline speed skating training trip. My plan was to join him from Sunday to Tuesday for a few fun days of skating and camping. Being the discerning eater that I am, of course I refused to waste this opportunity of outdoor eating and cooking on just any convenience food. Fresh fruit is a must for dessert because it's refreshing. I packed some cubed pineapple and watermelon which stayed cold and sweet until the last day in my new cooler. Along with my portable mini gas range and anodized aluminum camping cookware, I practically had a complete outdoor kitchen at my disposal. It's amazing what we could achieved when we pooled together our resources. With JS's rice cooker, KN made rice to serve with the very tasty bulgogi beef which he pan seared on the little gas range. It was a traditional Korean meal that we enjoyed with spicy kimchi. I must say I was very impressed with KN's cooking skill! Without the foresight of how cold my first night turned out to be, I was glad that I planned for a hotpot dinner. We enjoyed a selection of thinly-sliced beef ribs, pork jowls, various fish cakes, chinese beef meatballs, oyster mushroom, daikon, baby Shanghai bok choi. It was not a particularly large variety but enough for two people not to get bored. For dipping sauce, I brought my favourite satay barbeque sauce and fried onions. 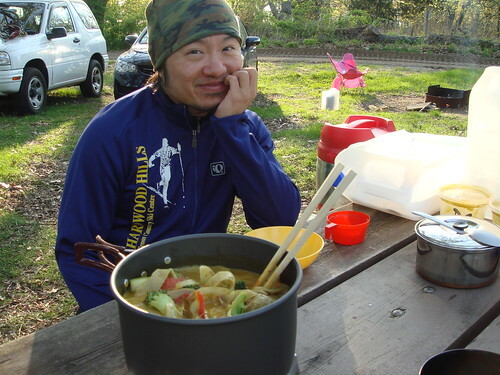 Cooking our dinner around a piping hot pot of broth in the chilly evening alfresco was absolutely amazing. As an added bonus, clean up was a cinch. For dinner number two, I anticipated that we would have left over sliced meat from the hotpot dinner. Instead of the predictable noodle soup, I thought that a curry would be the perfect answer to use up all those meat. With my connection to Salad King, I brought with me two tubs of their famous Golden Curry sauce completed with assorted sliced vegetables. It was a simple matter of heating up the sauce, meat, and vegetables before a delicious dinner was ready. For the convenience factor alone, this was definitely a brilliant idea. After this short but fun trip, I think I caught the camping bug at last. I can't wait to go to my next camping trip! KGR is shopping for a ricecooker and he asked me today about the capacity. My Chinese background means that I practically grew up with one or more ricecookers in the house so I proceeded with an explanation. CW: Every ricecooker comes with a little measuring cup. You use it to measure out the raw rice and you match the amount of water needed for your rice with the corresponding marking on the rice cooker. KGR: So when a ricecooker says it has a 3-cup capacity, what does that mean? Does it mean it takes a maximum of 3 cups of raw rice or it makes a maximum of 3 cups of cooked rice? CW: Well...erm....neither, actually. That measuring cup is not quite as big as a standard baking measuring cup so you definitely don't want to lose it. EVER. My family likes to keep it in the rice container. But....erm....the capacity more or less means the number of cups of raw rice it can take. More or less. KGR: When you said it's not as big, you mean by how much? CW: Hmmm, good question. About 80%? I guess? KGR [Google]: Actually, it's 75%. Hey, you're not too far off the mark! For something as simple as ricecooker capacity, I didn't realize it requires such a lengthy and ambiguous explanation until I had to actually put it in words. It is a good example of how things that I take for granted can seem so foreign to people coming from a different background. Vive la difference.....? To show my support for EG's dedication to Atkins, I decided to make him a little sweet treat. A long long time ago, in his BD (before-diet) days, we wandered in a cheese store and I pointed out that mascarpone cheese is deliciously creamy with a super high fat content. Apparently this piece of information lodged in his mind and he bought a tub of mascarpone cheese yesterday during his weekly Atkins grocery run. However, he mentioned to me this morning that mascarpone tastes faintly of gasoline and he's not exactly thrilled about the taste. How can anybody not like the cheese that gave us tiramisu?! I almost fainted right there on the spot. Actually, when I'm too lazy to turn mascarpone into tiramisu, I like to spread it on a lady finger for a quick (& fatty) snack. I enjoy the contrast between the crunchy cookie with the creamy cheese and the additional sweetness surely doesn't hurt. To keep this spirit in mind, I thought that an almond macaroon can easily be made into an Atkins-friendly incarnation. Hopefully this cookie will change EG's impression about my beloved dessert cheese. Preheat oven to 325F. Line a baking tray with parchment paper. In a mixing bowl, mix together ground almond and 1/2 cup of Splenda. Set aside. Whip egg whites on high speed until frothy. With the mixer still running, add in sugar and remaining Splenda until meringue reaches just past soft peak stage. Whisk in vanilla extract. Due to the low amount of sugar in this recipe, the meringue will likely not turn glossy. Fold in the almond mixture gently. Do not overmix...you want to keep the meringue as light as possible. Using a small ice-cream scoop (number 40, I think), divide batter into little balls on the baking tray. Bake for 30 minutes before turning the temperature down to 225F to completely dry the macaroons. The macaroons are done if it feels light when you pick it up from the tray. Cool to room temperature completely before storing in airtight container. Makes 20 cookies. What a fun day of eating! I've proven to myself today that good eating can be had no matter the circumstances. 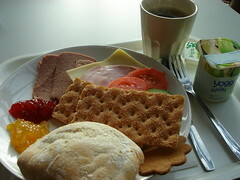 My morning started off with a traditional Swedish breakfast of liver loaf, cold cut, cheese, tomato, cucumber, etc...a typical smorgasboard. We left Connect Hotel Arlanda early in the morning for a day of sightseeing in Stockholm. The guided tour was fun and informative, giving me some background information on the city. For me, the best part of the day was the free time in the afternoon. 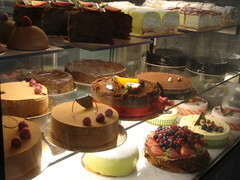 After much thought, I decided to seek out some traditional Swedish pastries and cakes. From talking to the cute and bubbly flight attendent on our way to Stockholm, I already had a good idea of some must-try desserts. I picked up a free copy of local restaurant directory completed with maps before we left the hotel. 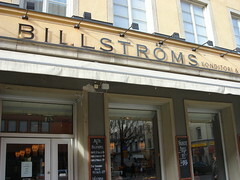 As luck would have it, the main feature article was on Billströms Konditori & Café, which has been in business since 1943. I admit that I am not particularly good with maps. However, I do have a decent instinct for direction such that I rarely get lost in a strange place. Somehow I managed to convince SL's cousin WL to join me on this little adventure so the two of us started walking to the sweet destination with minimal direction. Just imagine how ecstatic we were when we found the konditori! My favourite were clearly the kanelknut and the prinsesstårta. The kanelknut is a yeasty bread of cinnamon swirl topped with pearl sugar. 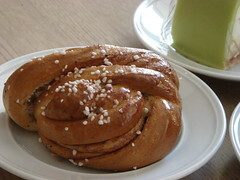 Unlike the North American-style of cinnamon bun, kanelknut is not at all sticky and the cinnamon flavour is more subtle. It makes for a great breakfast pastry to accompany a mug of coffee. The prinsesstårta is everything that I imagined it to be: ethereally light. 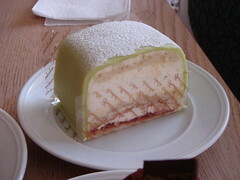 It is composed of a thin layer of sponge cake, raspberry jam, and whipped cream, all embraced by a thin layer of pale green marzipan. What you see in the picture is a single-slice serving of the cake. The whole cake actually looks a lot more impressive. The first time that I saw the pale green round dome topped with a pale pink marzipan rose, I immediately tried to think of a way to bring it back for SL to enjoy. It was just so cute and adorable in that fairytale kind of way!